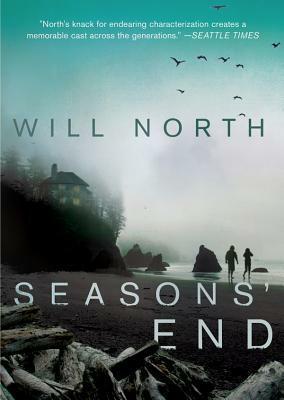 Will North’s Seasons’ End was an audiobook read for the Audiobook Jukebox Solid Gold Reviewer’s program. Thank you to them and to Blackstone Audio for the pleasure of listening to this story. This was immediately evident after listening to the first few minutes of the story, as I quickly became involved and part of Colin’s tale. Colin Ryan is in the UK on scholarship studying to become a vet. He isn’t from an affluent background, is grateful for the opportunity he’s been given to study abroad and maintains his thick Bronx accent. He is however, looking for a much better flat to live in and this is where he first meets Tyler Strong, a fellow American. Tyler Strong comes from a long lineage of affluence and everything about that affluence oozes from his every pore. He asks that Colin come live with him, and from that moment on they are inseparable. Tyler’s easy going nature is obviously a roaring hit with the ladies, of which he has many, therefore it comes as great surprise to Colin when one morning a Martha “Pete” Peterson arrives on their doorstep from the States announcing her identity as Tyler’s longtime girlfriend. Colin is shocked by this because a.) Tyler has never once mentioned a girlfriend and b.) he knew at that very moment, Tyler was out somewhere with someone else, as this was generally the way with Tyler. He had not mentioned that Pete was coming to stay, the topic had never come up. It is then left to Colin to entertain Pete, and to keep her in the dark at the same time. The days spent with Pete are the best of Colin’s life. He quickly falls in love with Pete, but never allows her to see this, for his loyalty remains with Tyler. We fast forward thirty years later, well, actually, the story does first open with Colin’s discovery of Pete laying in the middle of the highway and assumes she was attempting her suicide. Then it begins to reveal the past and how Colin has spent his last thirty years pining after Pete, but never revealing his love for her in all this time. He remains her true and steadfast friend. He also now lives permanently on an island in Puget Sound,the island where the families of the Peterson’s, Strong’s and Rutherford’s have summered for as long as anyone can remember. It’s the Labor Day weekend and the summer families are packing up, when Colin finds Pete. Here the story moves back in time as Colin tries to piece together the events that lead to Pete laying very drunk in the middle of the highway, in what appears to be her attempted suicide. It is now where the slow unraveling of the Peterson’s and Strong’s is revealed. Especially Tyler’s undoing. He is an incompetent lawyer, isn’t going to be making partner in the family’s firm, has made a complete mess of Pete’s family’s shipping company leaving it in shambles and complete bankruptcy. He’s an all around douchebag, continuing his cad-like lifestyle, sleeping with anyone that doesn’t move fast enough from his grasp. The events leading up to the beginning of the story are unveiled in what is a solidly enjoyable story. Throughout this story, of which I was enjoyed immensely, it was easy to relate the story of Colin-Pete-Tyler to A Dual Inheritance by Joanna Hershon as well as relating the depiction of the unraveling of the affluent, charm-life-filled families of the Peterson’s, Rutherford’s and Strong’s to Lookaway, Lookaway by Wilton Barnhardt. In its closing, I related a bit of The Great Gatsby as well, as Colin comes to the realization that he was a fool for buying into the “Island people’s” lives. He was a fool for thinking he could become a part of their world, much like Nick Carraway’s involvement with the Buchanan’s and Gatsby. Although I did enjoy this story a great deal, the narration by Tom Taylorson at many times left me often annoyed. While his narration of the story and of the male characters was spot on, it was his narration of the female characters that bordered on the ridiculous. Sorry, it was ridiculous. Taylorson lent flaming drag queen voices to North’s female characters. Each one worse and more ridiculous than the last. However, as I was enjoying the story I was willing to listen beyond it and work past it. It was difficult at times, therefore I may suggest that picking up the hard copy of the book may be the way you wish to read Seasons’ End. For this story is highly enjoyable and the characters, the strong sense of place, and the rich description and metaphorical writing are something that should be experienced. I will look for Will North’s work again. A solid 4-star read. I won’t even remove a star for the narration, for the most part it was very enjoyable as well.